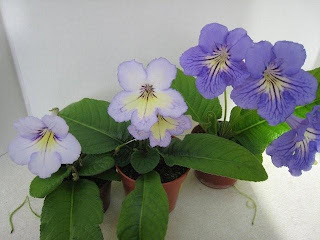 North Star African Violet Council Twin Cities: The Strep Results! Last year at the February meeting, strep seeds of some self-pollinated pods were passed out. It was a club experiment to see if we could grow streps from seed and to see if there was anything interesting with the offspring... if they all would look like their parents or if with the hybrids there would be quite a bit of variation in the offspring. Sandy kindly sent a couple of photos of a few of the babies. You can see that there are not only some really, really pretty flowers from this planting, there are really quite striking differences in the various blooms. I am especially fond of the light color one with the yellow middles. 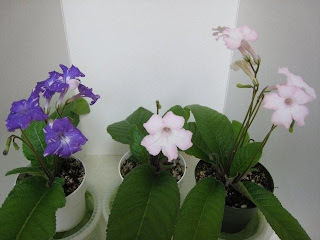 The yellow color is being bred for in streps like it was for in the African violets about 10 years ago. There are now a couple of (mostly) all yellow strep flowers like Alisa on the market. Thanks Sandy for the photos! !